Traditonal christmas day lunch in our family. You should optimize cooking time, because I do not like it rosa. Marinate beef with salt, pepper, thyme and mustard. 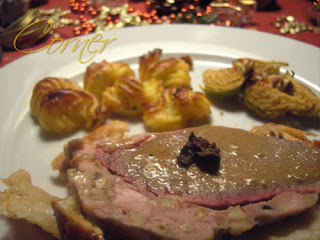 Prepare duxelle out of veal, bacon, canard liver, cream, port wein in a mixer. You may use cognac or madeira as you like. Chop white mushroom and fry in a pan. Add chopped porcino. You may puree mushroom-porcino mix and add to duxelle. Heat a pan and fry fillet, add cognac and flambé, cool. Smear about 1/3 duxelle on puff pastry, put beef on it and add rest of duxelle. 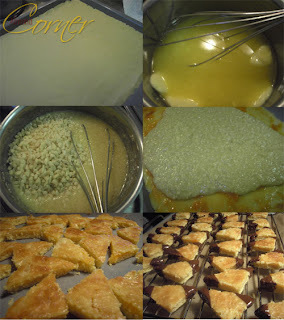 Cover with the rest of the pastry, and smear egg on it. I baked for an hour, but it depends how you like it and how thick the beef is. In a saucepan ( i used the same in which i fryed mushroom and beef) add meat stuck, porcino water and let it reduce half. Add cognac, and bind sauce with butter and/or cream. Add grated truffle. Cook potatos in salted water. Peel potatoes and press through ricer. Add butter, egg yolks and grated truffle, mix it well. 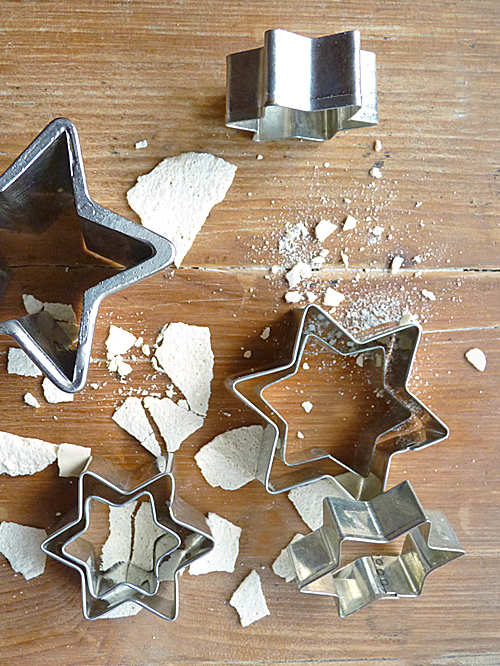 Press them on baking sheet with help of an icing bag. I also made some Brussels sprouts which I marinated with mustard, lemon juice and baked in oven. And served some salad with pommegranate and port wein dressing. 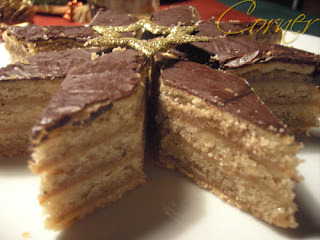 Traditional hungarian cake containing a lot of walnut. Warm milk a bit. It should be lukewarm. Add a teaspoon sugar and yeast. Add diced butter to flour, add lard, add eggs, sugar and pinch of salt, baking powder. Add milk with yeast. and knead a dough and roll out to the form of the baking form. Cut dough in 4 equal pieces. Smear jam on it and 1/3 of the walnut and sugar. Do this until you used each dough piece. With a fork make holes on the dough and leave for 1 hour on a warm place. Preheat oven to 180°C and bake for 30 minutes. After it is cooled down smear melted chocolate on top. Add diced butter to flour, add beaten eggs, sugar and pinch of salt. Mix in milk with yeast with milk and knead a dough. Leave for 2 hours on a warm place. Cook milk, add with sugar and wheet groat mixed grated poppy and let it cool down. 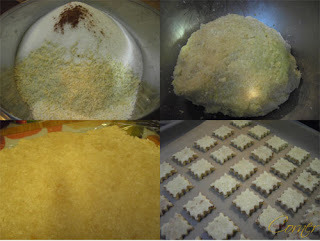 Mix grated walnut with sugar, lemon zest and vanilla. 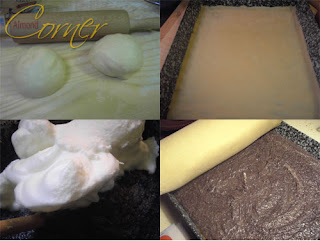 Melt butter with sour cream. 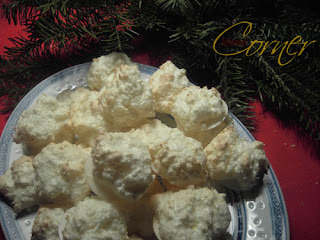 When you fill them, spread walnut mixture and sprinkle from the melted butter-sour cream mixture on it. Form 4 small dough pieces. Roll them out into a 1/2 cm thick rectangle on a floured board. Spread filling onto the dough, leave out a 2-3 cm strip at the longer side. Fold back a 2-3 cm strip at the shorter sides (prevents the stuffing from coming out). Roll the dough up and place them in buttered oven dish. Brush the top of the rolls with slightly beaten egg. Prick the top and the sides of the rolls with a fork, it prevents cracking. Bake in preheated oven at 180 °C for about 35 minutes until the top gets a nice brown colour. My absolutly favourite poppy pie. It is really fantastic if one likes poppy. Mix all ingredients into a smooth dough and cut in half. Roll out one and put in a buttered form, smear apricot jam on it. Boil milk with sugar, add grated poppy and wheet groat. After poppy cooled down add lemon zest and beaten egg white. Pour poppy into the baking form and cover with the another rolled out piece of dough. 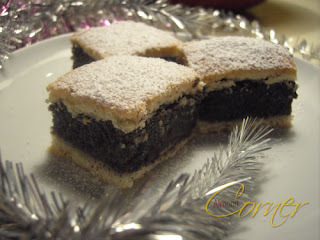 There is a swiss cookie called Brunsli, which is made of dark chocolate. 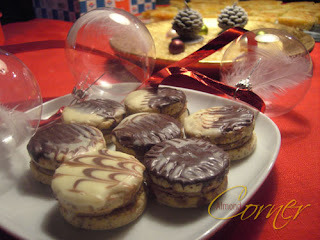 I created a version with white chocolate. Add sugar, grated almond, lemon juice, cinnamon, sherry and vanilla. Mix together and leave for 1 hour in the fridge. Roll out between foil for about 1 cm thick. 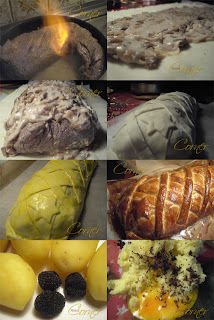 Leave for 6-7 hours and after bake for 3-4 minutes on 250°C. 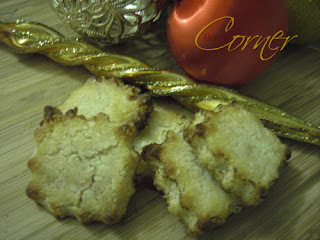 Mix flour, hazelnut, butter sugar, lemon zest and rum to a dough. Chill for 30 minutes. Roll dough out for about 1/2 cm thick. Make round forms out of it. Bake for 12 minutes on 180°C. 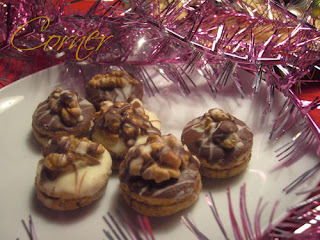 After cooled down smear jam on each half and coat with chocolate and put a half walnut on top. For the chocolate cream beat 2 eggs with sugar and vanilla, add chocolate above steam and mix till it is molten. After it is cold add butter. 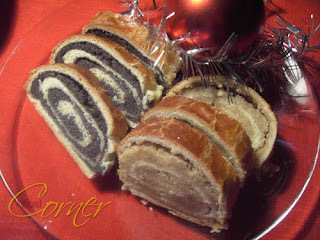 This a recepie I wanted to make since years and finally I managed to bake it. Mix butter with sugar, vanilla and egg. Add flour and baking powder. You have to get a smooth dough. Roll out dough and place in a buttered form. Melt butter with sugar, vanilla and water, add almond and mix it. Let it cool down and smear on top of the rolled out dough. Bake for 20-30 minutes and let it cool well down. 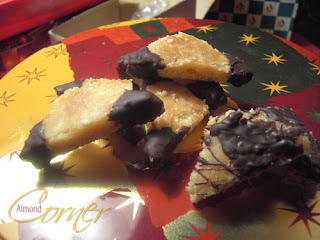 Cut into triangles and decorate with melted chocolate. Beat egg white with a pinch of salt, vanilla and sugar. Add slowly powder sugar and beat on. Add corn starch, lemon zest and coconut. With a help of a teaspoon place mixture on the wafers. Some years ago, during my last school year, we've had a Swiss exchange student in our class. 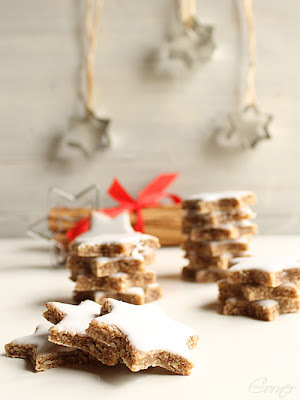 Around Christmas time she surprised our class with some selfmade cinnamon stars, the so called Zimtsternen. 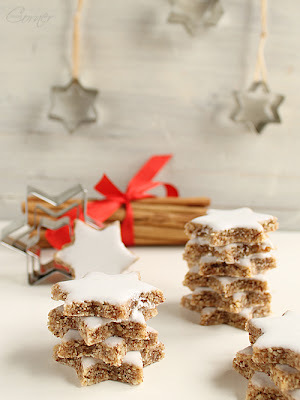 They were so totally delicious, besides I am anyway a cinnamon fan, so I had to ask for the recipe, even though I did not even think about baking or cooking that time. This year, I baked these for the first time together with the neighbour's daughter, who enjoyed to brush the stars with the glaze a lot. 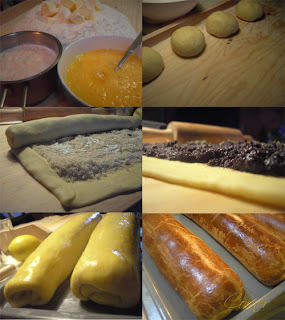 Knead a dough using all the ingredients and chill for 1-2 hours. 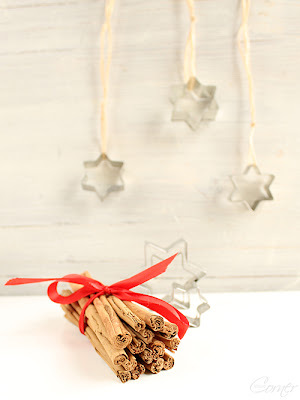 Roll out between two layers of foil and cut out stars with a help of a cookie cutter. For the glasur beat egg white with a pinch of salt, then add powder sugar in small portions and beat until shiny. 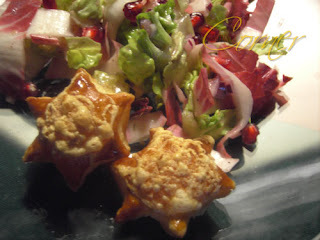 Brush stars with the glaze and bake on 170°C for 10-12 mintues.